Here you have another popular Easter recipe. This one is for fánky, little pieces of fried dough that resemble in taste American funnel cakes. 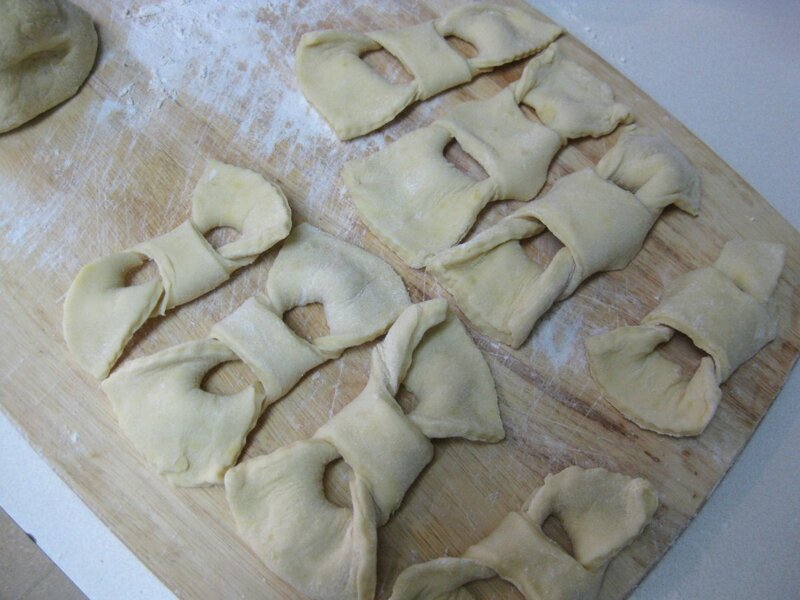 But they look differently, they are usually made in the shape of bowties (mašličky). 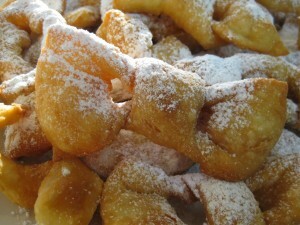 Fánky are somewhat similar to šišky (Slovak donuts). But since they are thinner, they come out flaky, pastry-like. Very delicious! The ingredients below are approximately half of what the original recipe in “Recepty Starej Mamy” called for. However, I kept the sugar as given. I’ve noticed that many Slovak treats made from the recipes in this old cookbook are not sweet enough for me. Perhaps it’s because I’ve been living in the US for too long and got used to everything being so sweet. But also, I think that in Slovakia it used to be whole lot more common for the dough to be less sweet, and instead the additional sweetness was provided by a coating of powdered sugar. These ingredients yield about dozen bow ties. 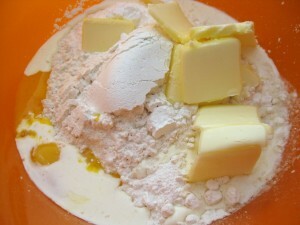 Start by combining flour, butter, sugar, yolks, cream, milk, baking powder, salt, and the wine (or rum if you prefer). 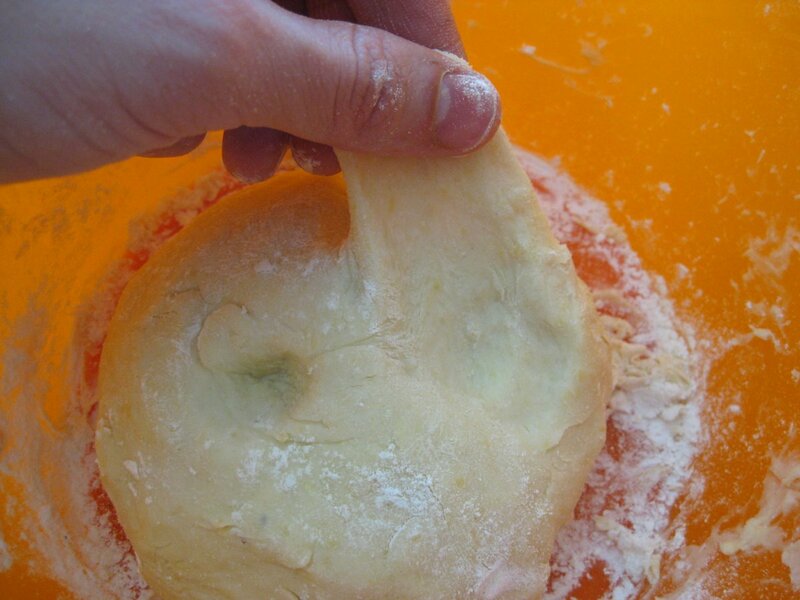 Mix together for 10 minutes until you get smooth elastic dough. Add more milk if needed. Form into a ball, dust with flour, and let rest in the fridge for an hour. Roll the dough out to thickness of about 1/6th of an inch. It may help to cut the dough into two halves, especially if your board is on the smaller side. 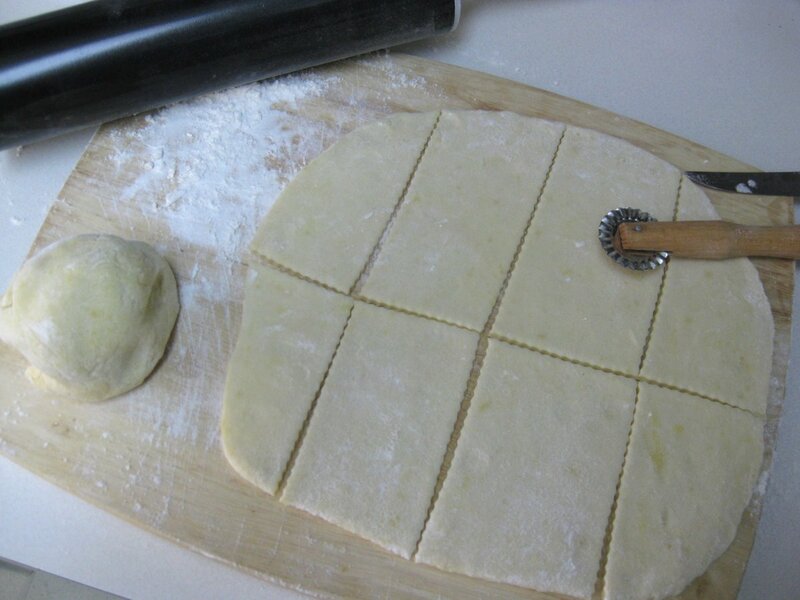 Using a dough cutting wheel or a knife, cut the dough into rectangles about 2×3 inches. Then cut two slots in each rectangle in direction parallel to the shorter edges. Loop one end piece through the slot closest to it. 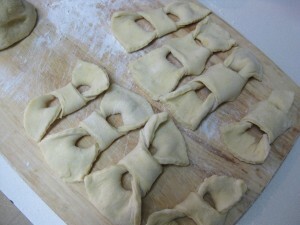 Then repeat with the other end to make a dough bowtie. 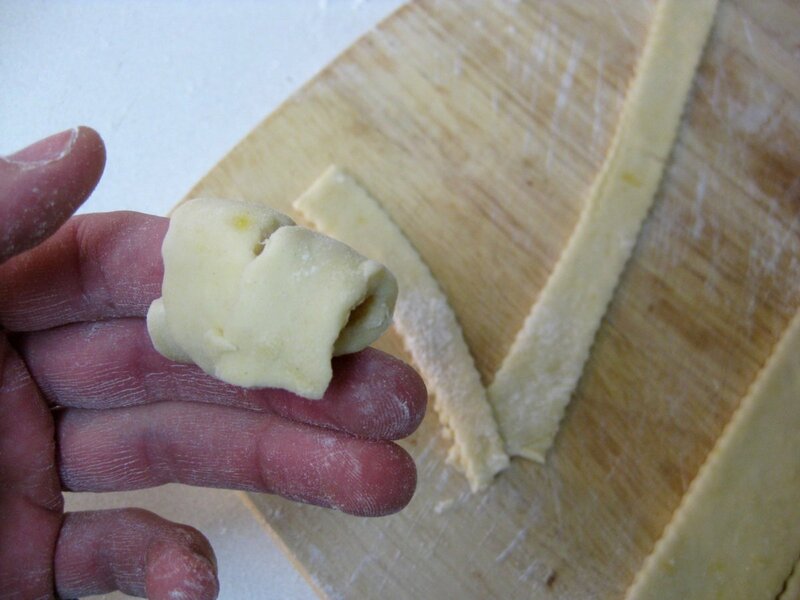 You can also just cut the dough into thin strips which you roll around your finger. Fry all this goodness in oil that is not too hot – I kept mine just a tiny turn past low. Fry on both sides until the dough gets pinkish light brown. 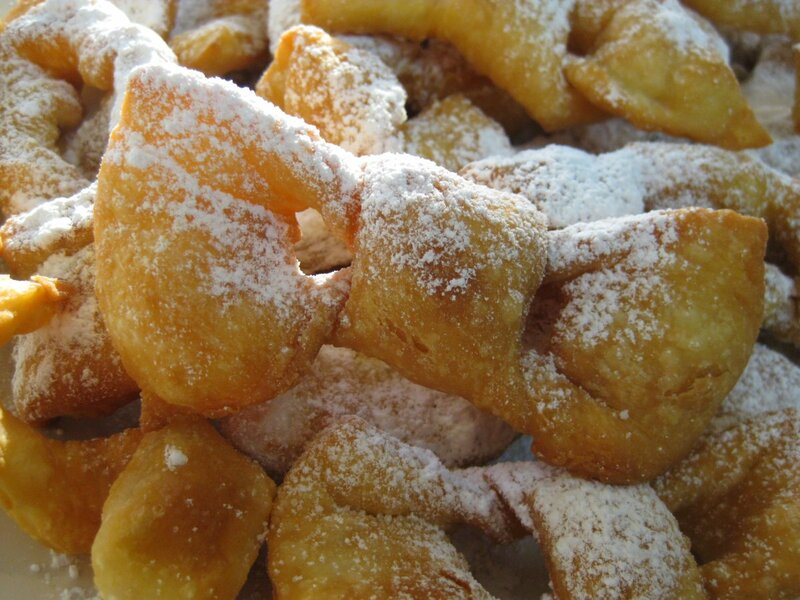 Scoop the fried fánky with spatula onto a plate covered with paper towels. Use another paper towel to pat dry off the oil from the top. 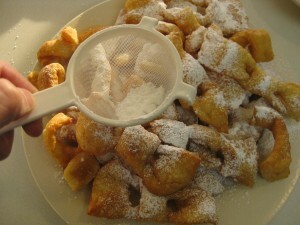 Then coat the fried dough in powdered sugar (I also mixed in half packet of vanilla sugar), just like funnel cakes. Happy Easter! Is this recipe similar to Boz~ie Milosti? If I can find it, I have a recipe for these that my great-aunt brought with her from Slovakia when she emigrated about a hundred years ago which I could share with you if you are interested. fánky, čeregle, krapne, božie milosti, just different names for this delicious treat. I am looking for a butcher shop still making traditional easter meat we called it jolooowitz this is phonetically spelled. YES! That is exactly what these are. Thank God for this website and these recipes. Grandma never wrote any of them down and if she did, her sister had them after grandma died, but now her sister, Sister Mildred who was in the convent for 75 years has passed also and I’m not sure where any of her stuff went. I know these as Božie milosti as well. There’s many names for these. Our family recipe is similar to the one here, although ours used sour cream in the dough, and whiskey. My Mom cut them into diamond shapes with a single cut in the middle and pulled one end through the other. I love them. Haven’t had them in years. So good! I was going to ask the same thing. 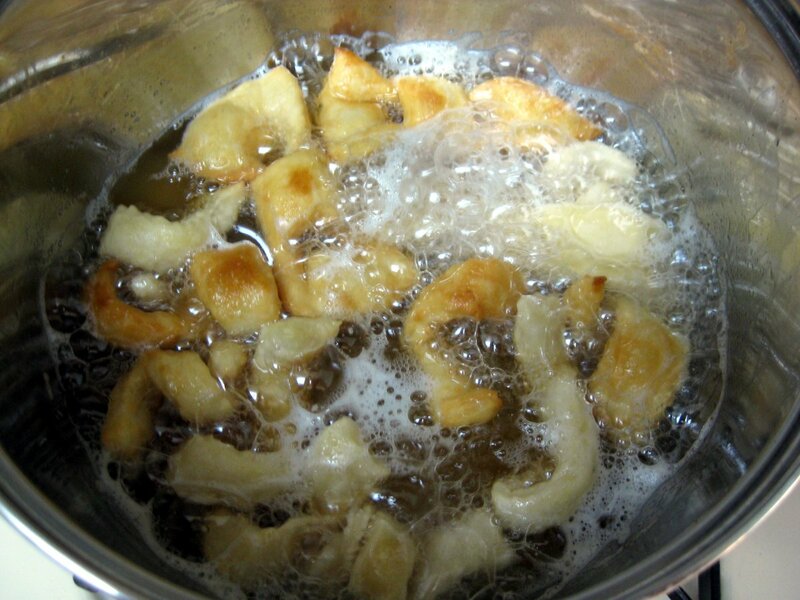 My grandmother (originally from Myjava) used to make Božie Milosti, as well, particularly for Easter. It is very similar to this recipe. The biggest difference I can tell off-hand is the shape –she would cut them into diamond shapes with 2-3 slits in the center. I’ll be making them for Easter this year. Klč, “klčovať les” means “grub the forest”. Thank you, I’m trying to find more history on my family tree. That surname is the first generation we have record of. Thanks for letting me try your fried fánky last night. They were great. Looks like some people fry them after cutting the slits instead of looping the ends through to make the bow tie. Or you can cut out a square, make one diagonal cut and loop one end through it to get a different kind of shape. I am planning on making these for Easter! I love a lot of these recipes; I haven’t made any yet, though I’ve had some that look and sound similar when I visited my great grandmother. Though I have made zemiakove placky from a different recipe. I love them. Lubos, I have a very authentic receipe foE Lashanke, I have first a question for you. You show on this site how you have traveled all over so many parts of the world, That is wonderful, however that is very costly. Now you ask as a Slovak for donations to you for this web site? Please explain. Hi Philka, what are Lashanke? I can’t think of a dish by that name. Could you describe what’s in them? About your second question, it’s quite simple. I’ve done quite a bit of traveling when I was working. I am currently in grad school so my income situation has changed. The annual hosting fee for this site is not all that great, it’s only about $100. However, your donations help offset secondary costs such as food giveways, travel to Slovak festivals, printing of the recipe brochures, etc.. I also wanted to buy a new camera that would allow me to take better photos for the site, and donations from readers like you helped cover almost half the cost. I am really thankful for this! Also, donations are what motivates me to keep working on this site. It takes about 3 hours to post a typical recipe, not including the actual cooking time. On top of that there are many hours spent working on the underlying programming code, answering readers comments, and so on. These are hours I could otherwise spend working at a job and actually making money. Many other food bloggers run ads on their site to offset the effort put into their blog. I used to have ads on slovakcooking.com until the end of 2010 when I decided to drop them. When you use service such as Google AdSense (the most popular ad serving platform) you have very little control over the ads that show up on your site. If there is a single theme to this site it’s that you don’t need expensive gadgets and gizmos to cook delicious food. Unfortunately many ads are just for such products. Hence, I don’t feel too comfortable advertising products I would otherwise not endorse. Most people do not realize the fact I have no control over the products that appear in the ads, and hence I thought it’s better to get rid of the ads completely. Hello to all Slovak loving foodies! Easter is in this month of April, 24,2011! I would like to introduce All of you including you Lubos about Rozki. My “Babbo” made a Rozki that was so delicate and different from anything I have seen on you site. A sweet yeast dough and rolled out fine and a fruit filling in each. If you your any of your readers would be interested, please reply and I will post it! YES PLEASE COULD I HAVE YOUR ROSKI RECIPE. THANKYOU. Ahoj to you misha! thank you for asking for my roszke pastry receipe. Bake: 15 to 20 mins. In a large bowl, mix butter, cream cheese , sugar and vanilla until light and fluffy. Combine flour and baking powder and add to butter mixture a little at a time,mixing in with your hands blending well, gently. Divide dough into 3 balls, cover with plastic wrap , refrigerate 2hours or overnight. Heat oven to 350 degrees F. Take one ball out at a time and roll on smooth surface dusted with equal parts withe sugar and Powder sugar. approx 1/8 thickness. round circle. 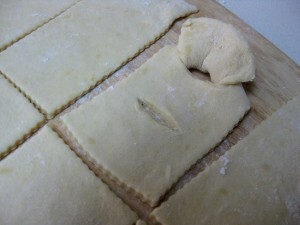 then cut the circle in half and then into pie shape pieces. Fill with walnut filling or apricot. a small bit of filling at the wider end and roll up gently crescent style. Place on parchment paper lined baking sheet.Bake approx. 20 mins or till very lightly brown on edges. Remove and place on cooling wrack Sprinkle with Confectioners sugar. Serves so nice with fresh coffee tea, or Milk! When I was a child my Mother made these for Easter every year, and sometime on my Birthday! If you or anyone on the site have a question about the Rozke, Please write to me! Hello! Could you clarify in the above fanky recipe what is “cream”? Also, I am making these for my son’s cultural project as my mother made these for me as a child….can I omit the wine/rum and will it make a difference in the recipe? Thank you for your response! Hi Mary, I used the regular heavy whipping cream. However, I’ve seen these made with sour cream too so it’s up to you. And the rum taste is very slight so I don’t think it will make any difference. Or you could use one of those rum flavor substitutes. Lubos, Thanks for this recipe. My grandmother and great aunt used to make them. We loved it. They made them with rum and sour cream, just as you describe. They are both in heaven now. I will make this for Christmas to carry on our traditions. Skus tento link.Akosi sa mi to nepodarilo a klikni na postup.Sorry. Wow! My Great Auntie Paula makes these. Calls them Ooshki (likely spelled wrong, I am going off of sound). Shes Slovene (I am a mongrel of Slovak, Slovene and Scottish). Also she shapes them… lazier? Its a single slit in the middle and then you pull one end through and fry them. I love your site, by the way. It is great that you give a visual with the steps to the recipe. My halusky did not quite turn out as visually appealing as yours, but it tasted pretty close to my moms, I added and egg. For Easter we would have ham, kielbasa, cheese, hard boil eggs, pasta and what I would call a meatloaf. Does anyone know what this meatloaf is called and what the recipe is? Meatloaf / sekaná/ is actually a hamburger. Excuse me but a hamburger is nothing like a meatloaf. Hamburger is a pure beef (though usually a low grade ground beef) no added bread, milk, egg, etc. You grill or broil hamburger and put it on a bun and add some onion sliced tomato,etc. but you bake a meatloaf with all ingredients and serve it with potatoes and some salat. Sekaná- fašírka- mince- minced meat? Josephine, it’s just a small language difference but with significant difference in cooking and the end result. Both, a hamburger and a meatloaf, start with ground meat, however, after that a prep and cooking is different. You mix all ingredients for a meatloaf (aka egg, bread crumbs or bread soaked in milk, seasoning (salt peper majoran), onion, garlic, etc. and mixed it well than make a “brick” and put it into oven to bake ketchup is usually added on a top while baking it. Hamburgers? You just make a patties (flat cakes of meat) season it with salt and pepper, and grill it, eventually putting a sliced cheese on a top.. Then you put it into hamburger buns (round bread roll) and put on a dressing – ketchup, mayo, onion, tomatoes, mustard, letuce, whatever is your taste. Shape the brick, pour a little water and bake in the oven. Cooking time baste. Josephine, we already spent too much on this, no reason to continue. I say it again, hamburger as we know it in America, is a pure beef (you can check it at McDonald). Fasirka is Slovak food not exactly the same as American hamburger, though I like it. Meatloaf, or “sekaná” in Slovakia is cooked in the US and Slovakia pretty much the same way. With that, I am out of this discussion. Miro, you are not the expert on Slovak cooking. never said I was, but there are differences in “interpretation of what things mean. With that I think I’ll take a hiatus from Slovak cooking, just not to agrevate some folks. Lost my mother recently. I remember her making these when I was a child. They were always so special. Never had the recipe until now. Thank you. fánky, čeregle, krapne, božie milosti and also how about kruschiki? That’s what we used to call them. Grandma told me bozie milosti meant love knot. I used to love these and made them for my friends when I was a teenager. They always asked for them after that. Hi, I want to make these soon but I would like to know what type of oil is used? Thanks for this site, I love it! Yes! Oh, thank you. My mother used to make these and I loved them. Sadly, her handwritten cookbook was lost years ago so I was never able to make them. My fault, really. I should have paid more attention to her cooking when I was a kid. I look forward to making these for my children and grandchildren. These sound like what my grandmother called Cheregie! I need to dig out her recipe and make some…yum! We called the Fanky – Pan Kush-kee. If you are called to be a godmother it is tradition to make a whole bushel basket for the Christening. Our Family is from the Gemer region – Krokava, Sirk and Turchok. My parents were both born in Slovakia. If anyone’s interested, I have good (and proven) recipes for Filbert Crescent cookies, Birds’ Nest cookies (rolled in ground nuts with jam centres), and Jam Squares. All made with a good butter. Plus a good Walnut Torte recipe. The Jam Squares are made with 5 thin layers: a thin layer of a buttery yeast dough – then a layer of ground walnuts – another layer of the pastry – a layer of a good red jam – a lattice topping of the same dough. The jam shines through after baking. Gotta love those Slovak pastries, right? 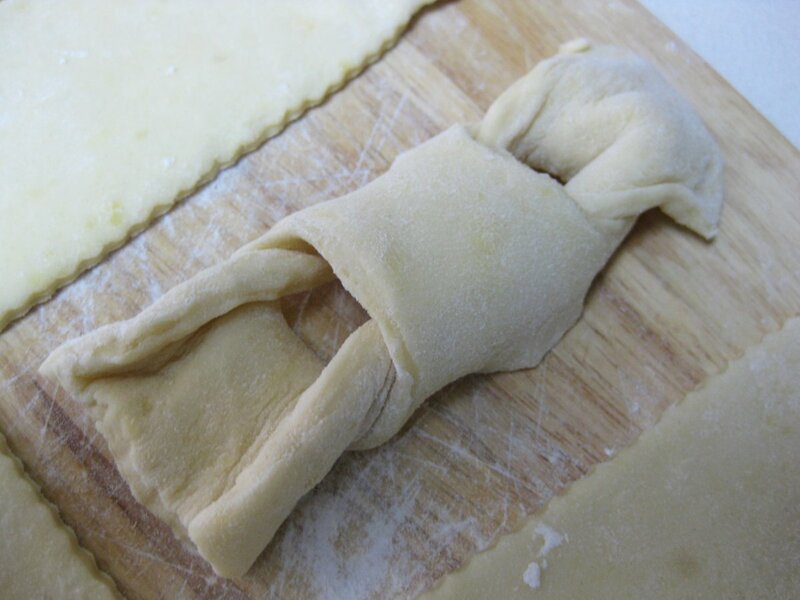 BTW – I also have very good step-by-step recipes for Halušky and Opekance. Vesalay Veaonces (Merry Christmas!) from Helen in Burlington, Ontario, Canada.